This is a tribute to Tilly, a Cockerpoo who stole my heart. Her owner was Gill who is a neighbour of ours and a very close friend. 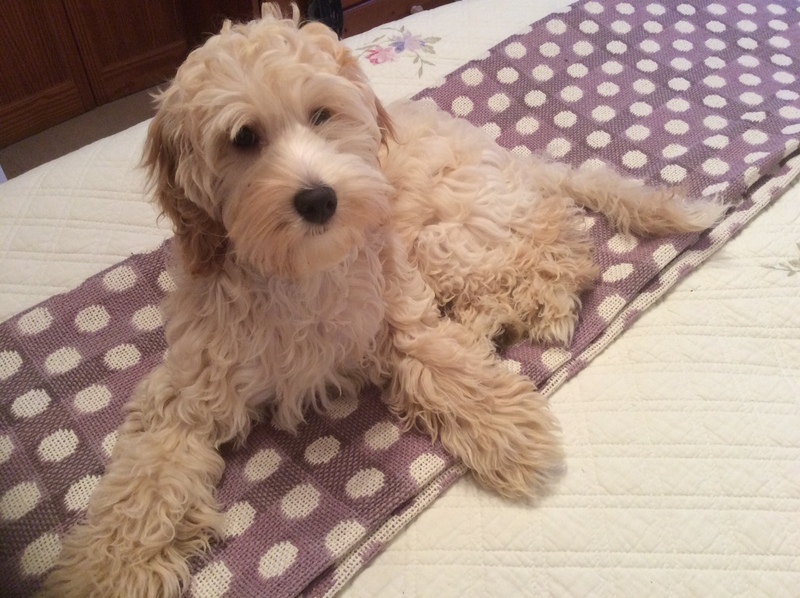 From day one, Tilly became part of our family and a big part of our daily life. 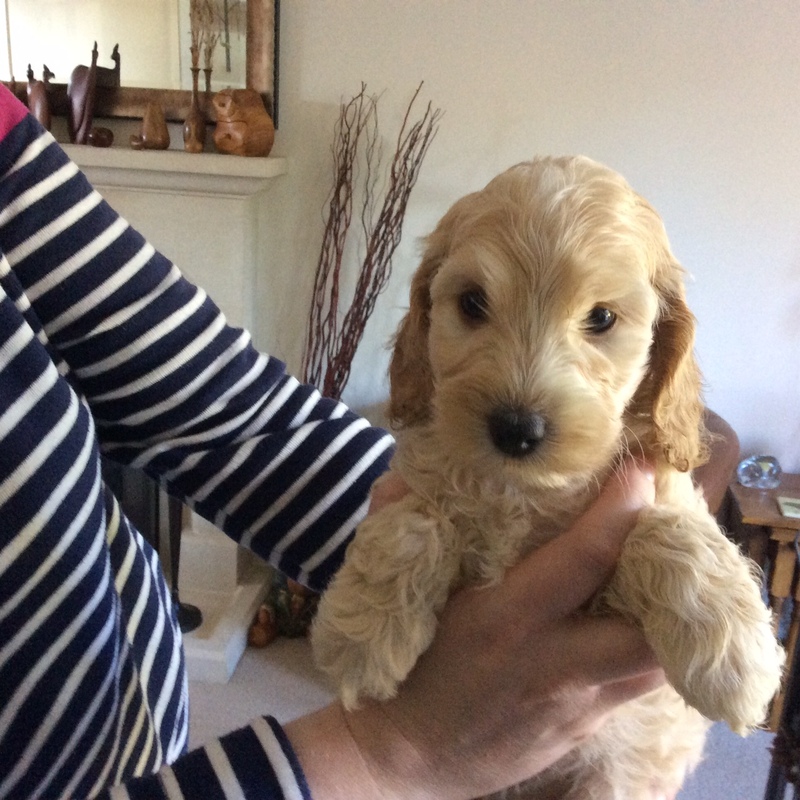 The photographs immediately below are of her when she had just moved into Gill’s house at about 8 weeks old. 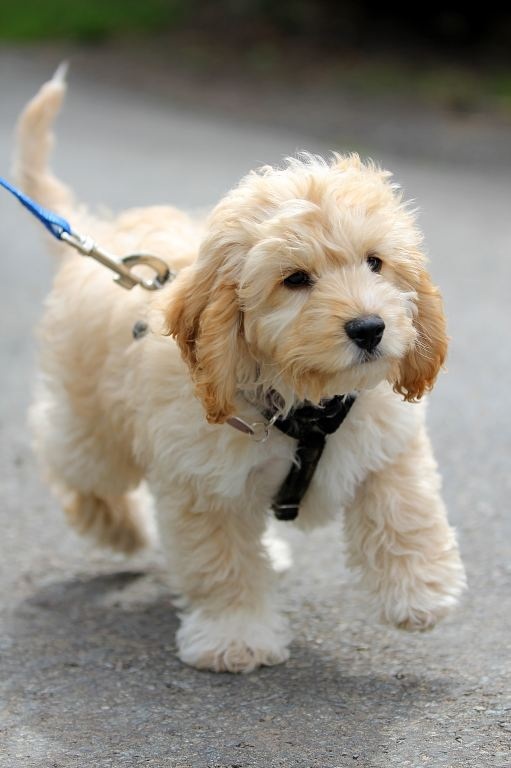 This is her striding out on one of her first walks with real determination in her eyes. She’s already beginning to take control and let you know who’s the boss! The lead is for her to pull you around, not for you to stop her going where she wants to go. Not having had a dog before, I wasn’t familiar with the idea of poo bags. Now just about all my trouser and jacket pockets contain a poo bag. You quickly get the idea of who’s in charge when dogs go round pooing everywhere and their so-called masters are the ones who do the clearing up behind them. Licking is evidently a form of doggy friendship. Tilly spent ages trying to lick my ears while I defended myself with both hands. She then decided that licking my hands was a reasonable compromise. 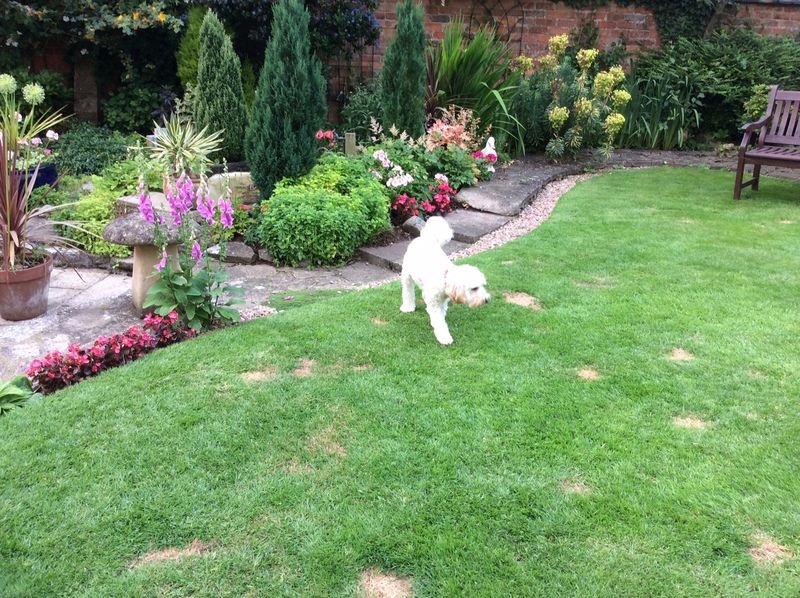 Tilly loved to be out in the garden, exploring amongst all the plants, chasing the birds and most of all trying to catch the squirrel which became a lifetime ambition. She loved to pick up small garden tools and chew the handles to the point where they were almost unusable afterwards. Most of all she would mischievously steal garden gloves. Her horticultural contribution was to leave decorative yellow patches all over Gill’s beloved lawn. 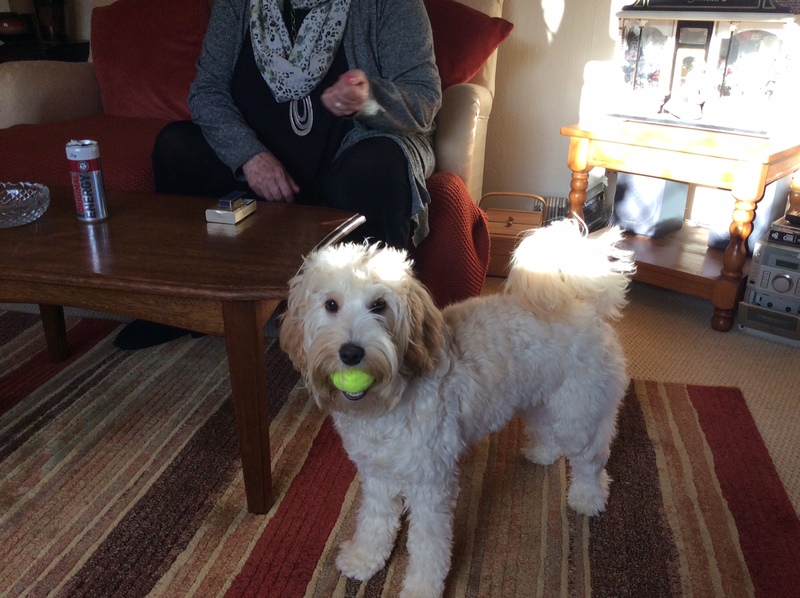 Tilly was a well-behaved dog but at about 6 months old we decided to take her to obedience training classes. I think these classes was as much about training the owners. Tilly quickly got the idea that good behaviour meant more treats. In the early days, Gill decided she would be a strict owner and have rules for Tilly which included no jumping on the furniture. That wasn’t Tilly’s way and the rule went out of the window quite quickly. 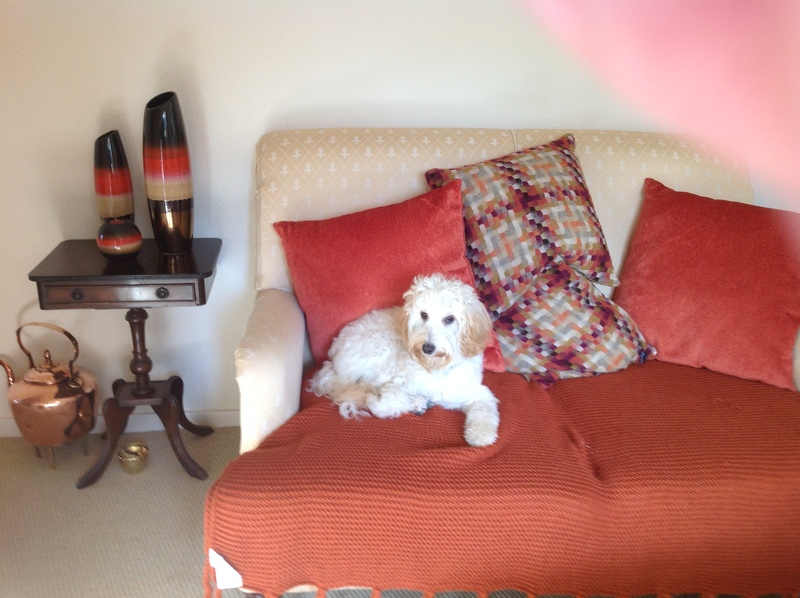 Tilly decided this sofa was hers during the day. 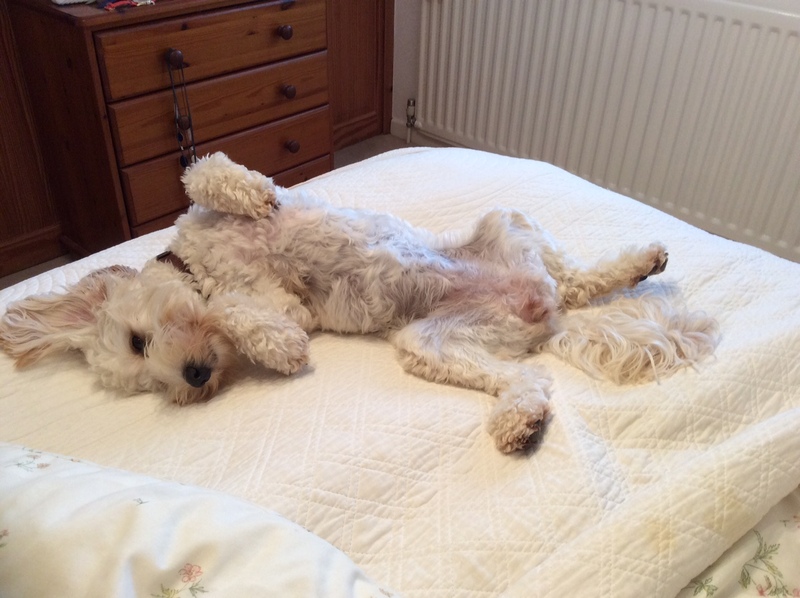 Tilly also thought she liked to sleep on the bed at night in spite of Gill’s strict rules. Not exactly a dignified way of sleeping, but a good way to get your tummy tickled. 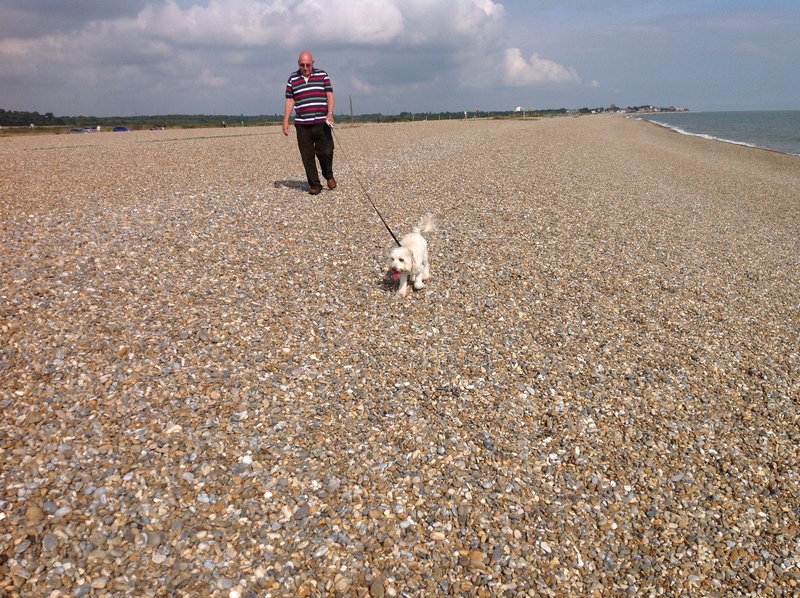 We went on several seaside holidays with Tilly and she loves being on the beach, although she didn’t at all like the idea of getting wet. She would run around the beach at 100 miles an hour. She loved to chase after other dogs until they turned around, at which point she hightailed it out of there. Most days I would take Tilly for a walk, either around the village or through the fields. She was my personal trainer pulling on the lead to make me go faster, eager to see around the next corner or over the next style. If I sat down to rest she jumped up on my lap to get a better view. We developed our own highway code which meant at every road junction on the command of “stay”, Tilly would pause and wait for the command “OK” at which point she would frantically run across the road until the fully extended lead pulled her back with a sharp jolt. Sadly these commands didn’t work on anything other than roads. She was also happy to chase after a tennis ball when out for walks, but she didn’t like the idea of giving it back when she got home. Tilly loved to meet people. She liked and was liked by everybody. 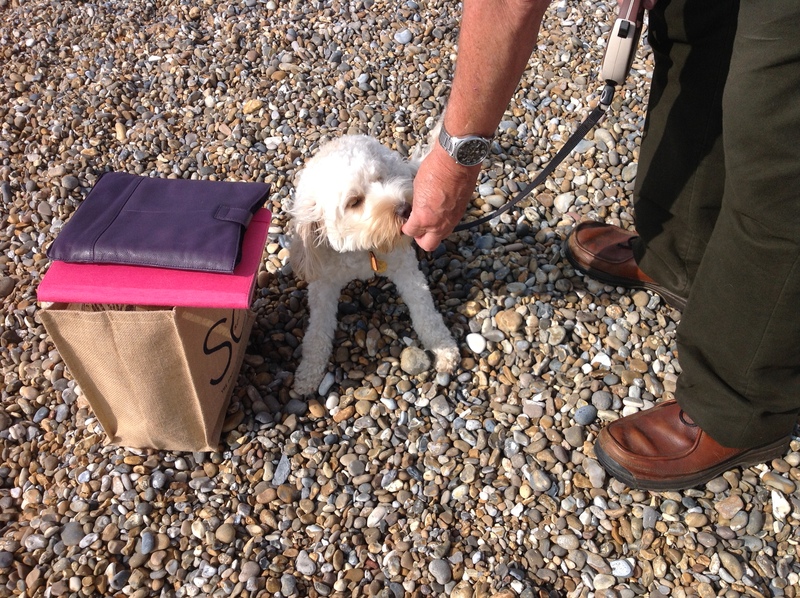 She was especially pleased to see “posties”, because Sue, the local postlady, always used to give her treats. That meant Tilly chased after red vans and everybody in a postie uniform expecting a reward. There is a tear in my eye now but a spark of joy in my heart every time something reminds me of her.